Successfully Added 2 Din Car Stereo + MP5 Player - 180 Watt, Bluetooth, AM / FM Radio, AUX In, USB, Micro SD, 7 Inch Screen to your Shopping Cart. 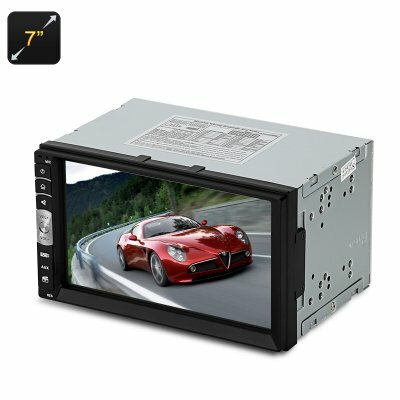 Enjoy 180 Watts of stunning audio right in your car with this 2 Din car media player. Known as an MP5 player this car stereo supports a wide range of music and video files that can be played direct from a USB pen, SD card or auxiliary in port. so you can plug in your music player or add up to 64GB of audio and video. With storage for days worth of music you will be prepared and kept entertained in even the longest journeys. If your phone supports Bluetooth then you can wirelessly connect it direct to the player. Once sync up with your phone its easy to share music and with hands free calls you'll be able to safely take calls from behind the wheel. This double DIN car stereo brings FM and AM radio support and you can enjoy 30 preset channels to store all your favorite stations. Flip between all your favorite channels at the touch of a button and enjoy pitch perfect equalization - no matter the genera this stereo will play it perfectly with its multiple sound modes. A colorful 7 inch screen is a great way to for passengers to view videos and will be the perfect way to keep both young and old entertained. Able to support a camera input you can easily plug in a rear parking camera and enjoy precision guidance while getting in and out of those tight parking spots. With a rear parking camera there won't be any hidden objects and a clear view for easy reversing will make parking a doddle. Take the stress out of driving and enjoy the open roads with this affordable 2 DIN car entertainment system that comes with a 12 months warranty, brought to you by the leader in electronic devices as well as wholesale car stereos and media players..